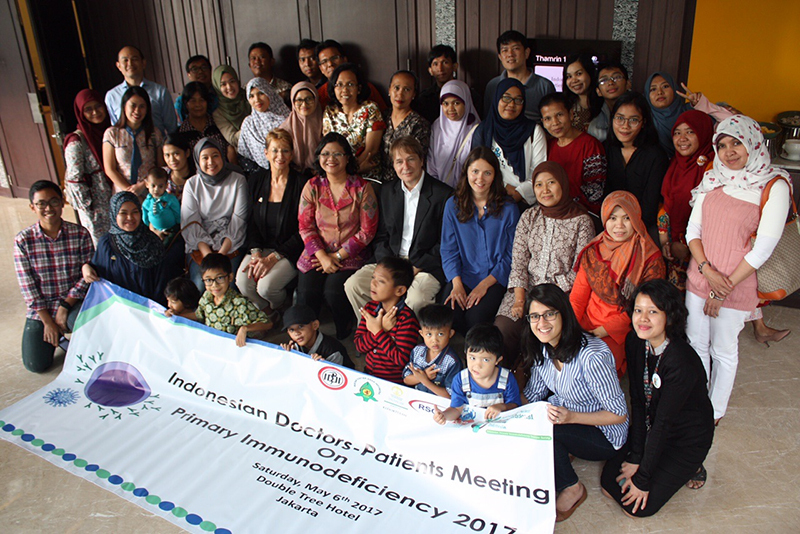 IPOPI held a two-day meeting in Jakarta, Indonesia, in collaboration with the Indonesian PID Patient Society (IPIPS), the Mangunkusumo Hospital in Jakarta and the South East Asian network for Primary Immunodeficiencies (SEAPID) on 6-7 May 2017. The first day was dedicated to patients and the second day to physicians. The Indonesian Patients Meeting was held on Saturday 6 and brought together Indonesian patients and their families to discuss national PID priorities. The event included presentations from NMO leaders and IPOPI representatives and a discussion among the participants. It was successful in motivating patients and parents to get involved in the IPIPS activities leading to the formation of a new patients’ committee. A fruitful dialogue between the doctors and the new patients’ committee was initiated and next steps for the organisation were identified to help the new patient committee to move forward. A Clinical Care Meeting held on Sunday 7 aimed at educating Indonesian MDs and medical students about PIDs and to extend medical knowledge beyond the capital region. 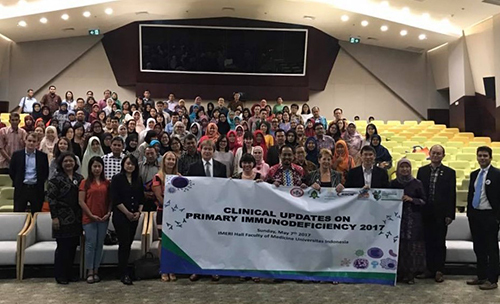 Over 170 participants took part in the meeting including paediatricians, allergists, immunologists, nutritionists, infectiologists, parasitologists, dermatologists, pathologists, stem cell specialists and general practitioners as well as medical students and nurses from 4 different islands of Indonesia. The meeting featured a panel of international speakers including among others Prof Martin Van Hagen, Dr Joanne Smart and Prof Monika Esser. The event was CME accredited and supported through an unrestricted grant from Biotest and Octapharma. Indonesia is an island state with a population of 260 million scattered in 17,000 islands. There are 6 PID referral centres located in two islands in Indonesia but only one centre offers state reimbursed Intravenous Immunoglobulin treatment. Bone marrow transplantation is not available for PIDs in the country. Patients in Indonesia struggle to receive accurate diagnosis and treatment and the ones that can afford it have to travel abroad to get the care they need. IPOPI has been organising numerous meetings in the South East Asian region (Philippines, Taiwan, Thailand, Malaysia, Vietnam, Indonesia, Singapore and Hong Kong) under the Bob LeBien Asian Development Programme. 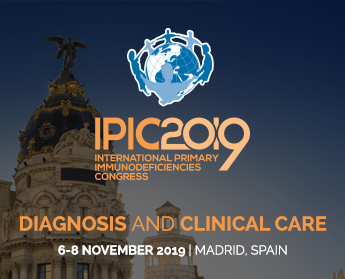 IPOPI works in collaboration with its national member organisations and doctors’ societies in the region to raise awareness of PIDs through the launch of new national patient groups and the organisation of clinical care events. IPOPI is convinced that through these collaborative efforts improved diagnosis rates and better access to treatment will be achieved in the region.